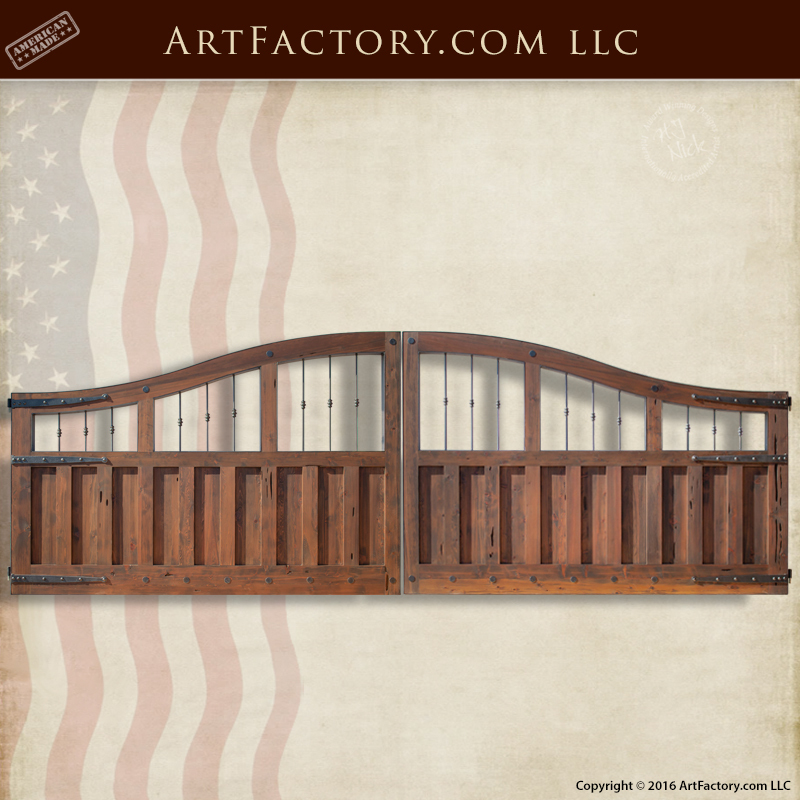 At ArtFactory.com, our custom wooden carriage gate can custom built to fit any size driveway. We specialize in designing and building custom gates that will make a statement at the front entrance of your property. Constructed from solid, full length timber, and hand hewn with mortise and tenon joinery, these stylish wooden gates feature a distinct arched top to provide additional height. The hand forged wrought iron infill bars fitted to the top section of the gates create a more decorative appearance, making this gate suitable for any residential or commercial driveway. The custom wooden carriage gate, and all of our wooden gates, is built from all natural materials. It is our belief that using natural material is especially relevant when creating fine quality wooden doors, gates, and furnishings. Additionally, like all of our wood products, it has been finished to fine art quality specifications using a multi-step, hand rubbed process. This process blends the stain into the grain of the wood. All of our wood products are finished using this intricate process, and signed by award winning artist H.J. Nick. This signature ensures that your product has been found to meet all world class fine art qualifications, and if of investment quality with future appreciable value in antiquity. All of our door and gate products include customizable, hand forged wrought iron hardware. This custom wood carriage gate features hand forged infill bars on the top section of the gate, and also has decorative strap hinges. This hardware is hand hammered over a coal fired forge by master blacksmiths. Our blacksmiths use only pure, solid wrought iron, because unlike other metals wrought iron doesn't corrode with exposure to the elements. This combination of old world techniques and top grade materials allow us to construct high quality hardware that is virtually maintenance free. In addition, all wrought iron hardware products are advance patinated with a hand applied, heat infused iron oxide finish. This type of finish won't crack, flake, or peel off like paints and powder coats. At ArtFactory.com we offer the highest quality of custom gates and gate hardware that is available anywhere at any price. Furthermore, everything is custom made to order with unlimited options in terms of style, color, and building materials. Most importantly we have absolutely no limitations on size. Solid wood entrance gates, with hand forged wrought iron hardware, and certified as fine art. To top it all off, we are so confident in the quality of our products and craftsmanship that we guarantee everything forever. When nothing but the best will do, call us at 1-800-292-0008 to get your quote for your very own custom wooden carriage gate today.